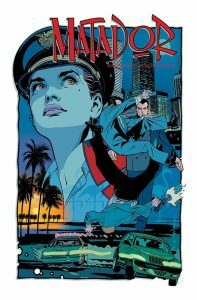 Image Comics is pleased to reveal an excerpt from the forthcoming Matador, Vol. 1 by Devin Grayson (Batman: Gotham Knight, User) and Brian Stelfreeze (Black Panther, Batman), which will find a new home at Image Comics this May and collect issues #1-6 of the original series. Matador is an explosive story pitting Lt. Isabel Cardona against a deadly serial killer in an edge-of-your-seat thriller that fans of Killing Eve and True Detective won’t want to miss. Dismissed as a quota minority hire by her work peers, Cuban-born and Florida-bred Detective Isabel Cardona makes no friends on the Miami force by insisting that a series of seemingly unrelated murder cases lead to an urban-legend contract killer known only as “The Matador.” Proving his existence soon becomes equal parts self-preservation and obsession—but how close to the dangerous Matador will Cardona have to get to make that happen? Matador, Vol. 1 (Diamond Code JAN190134, ISBN: 978-1-5343-1068-1) will be available at comic book shops on Wednesday, May 22. The final order cutoff deadline for comic shop retailers is Monday, Feb 4. It will be available in bookstores on Tuesday, May 28 and can be pre-ordered at Amazon, Barnes & Noble, Books-a-Million, Indiebound, and Indigo. Matador, Vol. 1 will also be available for purchase across many digital platforms, including the official Image Comics iOS app, Amazon Kindle, Apple Books, comiXology, and Google Play.